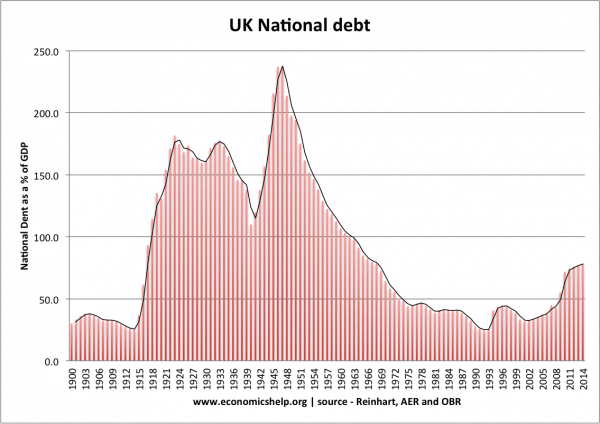 Home > Economics help blog > economics > Can Labour be blamed for the economic crisis? Can Labour be blamed for the economic crisis? Readers Question 1. Can Labour be blamed for the economic crisis (i.e. did they really ‘overspend’)? My view is that the global economic crisis is to blame, and that Labour could have spent less but that this is easy to say with the benefit of hindsight. I don’t think there is any economist who would try to blame the global financial crisis and global recession on the fact the Labour government increased spending on the NHS / education by a relatively moderate amount. Excess mortgage lending, especially in the US. Banks around the world taking excess risk with the purchase of risky sub-prime mortgage debt, rebundled debt – leading ultimately to the credit crisis. Deregulation of the financial sector in the 1980s and 1990s which made it easier for banks to increase lending, and reduce reserve ratios. This is only a very brief summary because I have written on this in more detail previously. But, it was essentially a failure of the financial sector. I would say it was a small mistake to run a budget deficit of 3% of GDP during the boom years. From a Keynesian perspective, it would have been more desirable to have run close to a balanced budget. I don’t think a balanced budget would have done anything to prevent a recession. The recession would still have occurred with the same impact, even with a balanced budget. 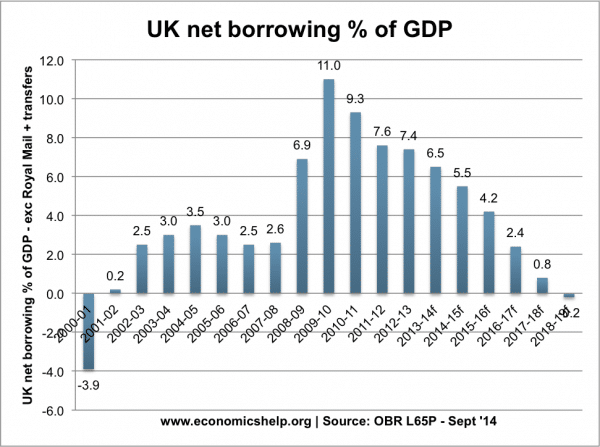 This is because the global recession had nothing to do with UK government spending/government borrowing. Tax receipts based on boom economics. One criticism about the UK finances (like many other countries) in the 2000s was that UK tax revenues were quite reliant on a booming financial and housing sector. When the financial market fell, tax receipts were very hit hard (and have struggled to recover). In other words, the UK fiscal position was not as good as it looked. 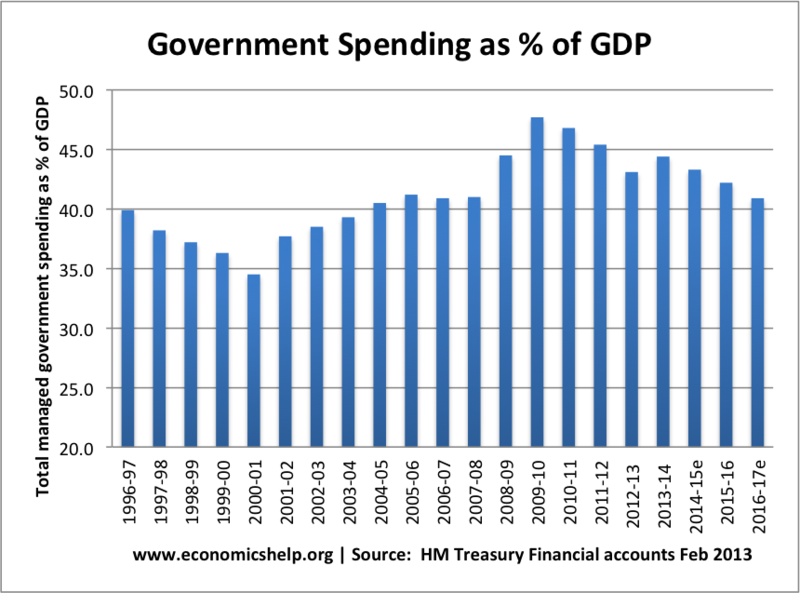 One argument is that if the UK had run a balanced budget in the 2000s, public sector debt would have been lower and the UK would have had more room for manoeuvre in pursuing expansionary fiscal policy when the recession hit and we needed expansionary fiscal policy. There is some credence to this, with a balanced budget and lower public sector debt to start with, governments may have felt greater confidence to borrow even more in the recession – when the UK economy needed expansionary fiscal policy. However, it is also worth being sceptical. 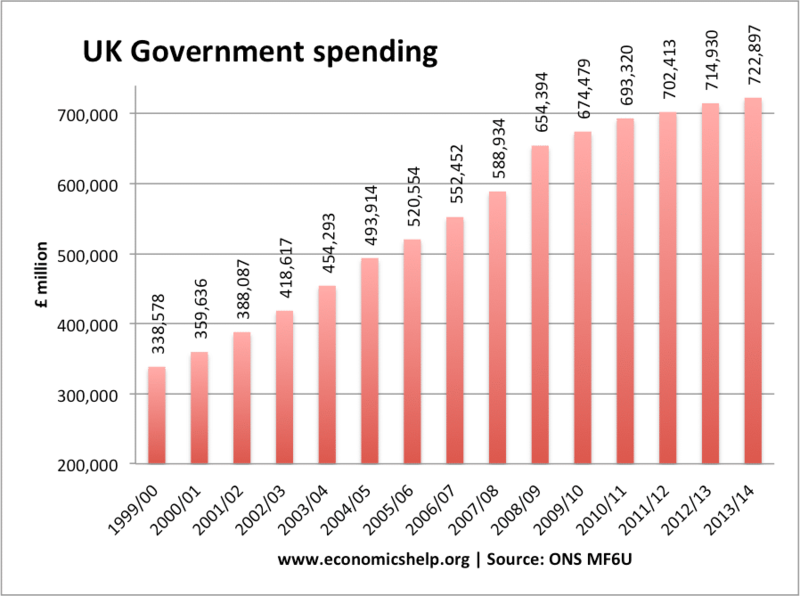 Public finances in the UK were very good in 2007; by comparison with the past 100 years, we were near a record low. Spot the economic mismanagement of the Labour government 1997-2007. The UK did have room for expansionary fiscal policy in 2008, bond yields were falling – there was never any fiscal crisis in the UK. The lurch to austerity post-2010 was unnecessary driven more by Micawber economics and the strong political appeal of austerity. My feeling is that even if the UK had run a balanced budget in 2000-07, there would still be the same strong calls for austerity. People who think £180bn is ‘too much borrowing’ – would probably think – £80bn borrowing is too much as well. Failure to regulate the financial system. The 1980s saw a period of financial deregulation, building societies became profit oriented banks willing to take extravagant risks (e.g. Northern Rock, Bradford & Bingley) In the US mortgage companies behaved with complete irresponsibility. The lax controls on mortgages and bank ratios was a great mistake. Failure to build up a bank bailout fund. In the boom years, it would have been a good policy to make banks pay into a fund for their potential future bailout should the market turn. This would have curtailed some of the bank’s risky expansion and meant that there was a government fund to use to bail out banks – rather than just relying on general taxpayers money. Housing market. The boom and bust in the US and European housing markets was a significant issue. The Euro. The Euro is a deeply flawed economic policy, which has a very strong deflationary bias. The pre-crisis period saw massive imbalances in the Eurozone area with countries in the south running current account deficits running into 10-12% of GDP. Without currency fluctuations, without a lender of last resort – in retrospect, this was a disaster waiting to happen. Greek debt. The one country with a real debt problem was actually Greece. Other European countries, such as Ireland, Spain and Portugal had very low levels of government borrowing at the start of the crisis but were forced into a debt crisis through the mechanism of the Euro. Was anyone calling for regulation of banks / mortgages / housing market? To be fair to Labour, they were not alone in ignoring the shadowy world of financial markets – just about everyone, including the majority of economists, didn’t realise what a hidden problem the financial markets were. For example, I don’t think even the most ardent Conservative supporter would claim that the Conservatives would have taken on the banks and prevented the financial crisis. On a personal note, I’ve found it quite difficult how it has become accepted the conventional wisdom that somehow Labour economic mismanagement was responsible for the great recession. It is a bit worrying how the banks have got off very lightly with the blame rather disingenuously put onto this vague idea of Labour economic mismanagement. This entry was posted in economics and tagged debt, government debt. Bookmark the permalink. ← Why does Vote Leave insist on using incorrect statistics? Interesting.I found the texts useful. Do feel Labour should have coped through the crisis better? I admit I did not read the full artical it seemed a little simplistic and bias.. I understood Labour in part deregulated the banks, so they could lend more easy and also used things like banking reserves (gold) to fund their spending, using the overdraft so to speak? If this is not true I would love to know. In recent times when the Tories had dips in the stock market (Brexit) the reserves reassured investors they had substantial funds to inject if needed, so the Tories Austerity , has to some extent corrected some of the mess Labour made? You do realise that it was the tories that deregulated the banks? The problem with new Labour in the 90s and early 00s was that they were taking advantage of the boom year, with little regard for potential bust years (which eventually came due to unregulated banks). The problem is that during the deregulation, banks gained power and couldn’t be controlled until the crisis. The issue is that because they were centralist, new labour missed the opportunity to do the socialist thing and re-regulate the banks when they bailed them out. If they had taken more control, they may not have lost so much support as they would have been seen to be for the people, protecting them against the crooks that took over the banking system. Instead they allowed them to continue, without much state intervention other than buying shares. So hang on let’s repeat that: You didn’t read the article, but you think it’s biased. And you spent I assume at least 5 minutes drafting a comment guessing (incorrectly) what the article might have been about, so you did have time. That doesn’t make a lot of sense to me and I doubt it will to anyone else reading your comment. Read the article. The amount of unsecured lending by the banks was the prime cause of the financial crash, mainly on mortgages and mainly in the US, but credit in general was far too easily obtained. That this was happening should have been apparent to anyone at the time. Whatever the shortcomings of the Labour government, to blame them for what was happening elsewhere in the world is ridiculous. In addition, it was never a socialist government, with many of the policies of the previous Tory administration left in place. I do not consider that Tony Blair ever comfortably fitted the image of a Labour politician. His whole background and upbringing was clearly rooted in a Tory outlook.